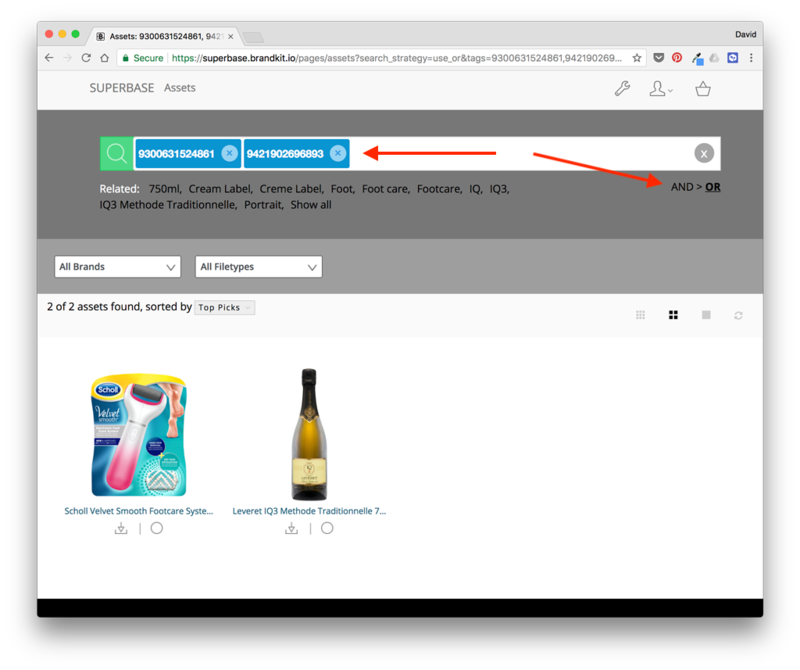 A number of our users need to search for a list of product id's all at once. e.g. Grocery trade looking for a selection of product images. Now you can Copy and Paste a list of comma separated ID's (e.g. barcodes) into the search box and we'll convert each comma separated value into a Tag. Initially (because AND is the default search) there will generally be no results as most ID's are unique. However switch to the OR search mode, and the results will pour in. Below is an example, where a comma separated list of two grocery product barcodes is pasted into the Search box and the OR mode is activated. You could use this feature to search for a list of Asset ID's or a list of Regions or a list of Photographers References, etc. Please note: If you have a custom Assets page created for you, you may not have this new feature available. In that case, please let us know you want it.